Together, J.D. 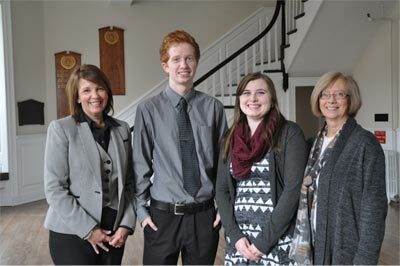 Irving, Limited (JDI) and the University of New Brunswick (UNB) are pleased to celebrate the awarding of four scholarships to talented UNB students. The recipients of the JDI NB Scholarships at UNB are, from the Fredericton campus, Randi Watson of Hazelton, N.B., fourth-year computer science; and Kyle Wood of Moncton, N.B., second-year chemical engineering; and, from the Saint John campus, Lucas Loughead of Grand Bay-Westfield, N.B., fourth-year business administration; and Kylor Doyle of Rothesay, N.B., second-year business administration. These scholarships to continuing students in 2015 are valued at $8,000 per year, and are renewable, based on academic performance, until graduation. The scholarships are funded by a $1-million gift made in 2007 by J.D. Irving, Limited to UNB that will allow the most talented students to fully apply themselves to their course work and to better prepare for their future careers. In 2016, up to four $32,000 JDI NB Scholarships will be awarded to incoming first-year UNB students, who are New Brunswick residents, studying business, computer science, engineering or forestry. These entrance scholarships are valued at $8,000 per year and are renewable for up to four years based on academic performance.